Aaron Boone sees Joe Girardi’s non-challenge and raises him a bumbling showcase of managerial incompetence. Boone failed — spectacularly — at the manager’s most basic responsibility: Put the team in the best position to succeed. That’s all. And he didn’t do it. The final score was 16-1 in ALDS Game Three on Monday night. It is the most lopsided postseason loss in Yankees history. An abject humiliation for the Yankees, Boone, and the people that hired him. The Yankees are facing a win or go home Game Four on Tuesday night. They’re lucky MLB doesn’t count this as two losses. I don’t even know where to start. Might as well start at the beginning then. Luis Severino was terrible. Even in the scoreless first inning, the Red Sox squared him up pretty well, and seven of his 14 balls in play were clocked at 100 mph or better. Seven balls in play at 100 mph or better ties his season high set on May 19th against … the Royals? The Royals. It was obvious early that Severino did not have it. Absolutely nothing about Boone’s bullpen management made sense Monday night. Watching the game live, I thought Severino should’ve been out in the third inning, specifically after Mookie Betts and Andrew Benintendi opened the frame with back-to-back singles. Benintendi’s was bloop, sure, but by then we’d all seen enough to know Severino was not right. The game was still 1-0 at the time! Act quickly and the game could remain within reach! 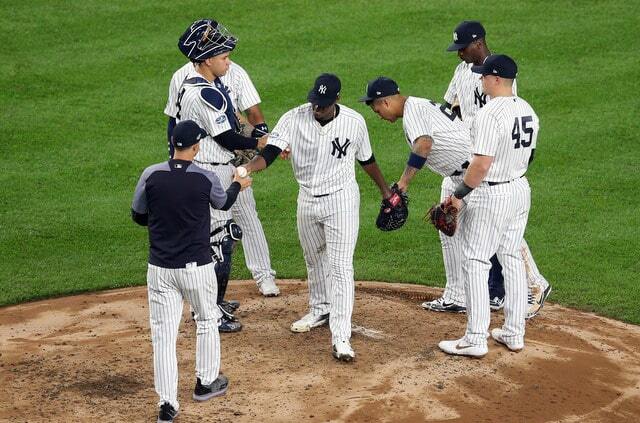 Instead, Severino remained in to complete the third inning. J.D. Martinez followed the back-to-back singles with a hard-hit sacrifice fly, Xander Bogaerts shot a single to right, and Rafael Devers got a run home with a fielder’s choice. Steve Pearce ended the inning with a line out. The Red Sox put six balls in play that inning and four checked in at 100 mph or better. It wasn’t until the Bogaerts single that pitching coach Larry Rothschild visited the mound. The Red Sox led 3-0. When the third inning ended, Lance Lynn and Stephen Tarpley were warming up. The bottom of the order, which featured two lefties (Brock Holt and Jackie Bradley Jr.), was due up in the fourth. Seemed like the perfect time to get Tarpley in there. That’s why he’s on the roster, right? He’s not going to face a lefty in the late innings. A fourth inning appearance against the bottom of the lineup made perfect sense. Why’s he one the roster if he’s not pitching there? Inexplicably, Severino was sent back out for the fourth inning. He really should’ve been out in the third. There was no good reason to send him out for the fourth. Severino had nothing and the Yankees were down only 3-0 at the time. A three-run deficit at Yankee Stadium with six innings play? The game was far from over. Move on from Severino and ask the bullpen to keep it close. Seemed obvious. Obvious to anyone but Boone, that is. This is what kills me: Severino was left in to load the bases with no outs. That is impossibly stupid. Boone was trying to steal some outs against the bottom of the lineup. That’s something you do in June or July, not the postseason. It looked to me like Boone got caught flat-footed. Severino allowed two first pitch singles and a four-pitch walk. It happened very fast and the bullpen didn’t have enough time to get warmed back up. That’s not a good excuse, mind you. That’s just what I think happened. At this point, we’ve already got two Boone blunders. Severino should’ve been out in the third inning, I thought. At the very least, he shouldn’t have gone out for the fourth inning. Then he was left in to load the bases with no outs! For the top of the lineup! With the Yankees only down three! In a postseason game! Good gravy. What is that crap? Remember how quickly Boone pulled J.A. Happ in Game One? Where the hell was that hook in Game Three? No manager is going to bring his closer into the fourth inning no matter the situation, so Chapman was a non-option there. Betances? Why not? He entered the fifth in the Wild Card Game. The top of the order was due up and Dellin’s been the “the other team’s best hitters specialist” so far this postseason. Green? He entered ALDS Game One in the third inning! Aside from Chapman, those dudes should’ve been in play in that fourth inning. Instead, Boone went to Lynn, essentially a fastball only guy with a league average 23.0% strikeout rate. Pretty much the last guy in the bullpen I want brought into a bases loaded, no outs situation. Going to an actual reliever to escape that bases loaded jam (or at least limit damage) before bringing in the inferior long man is New Age Analytical Manager 101 stuff. Boone failed to put the team in the best position to succeed, period. Lynn entered with the bases loaded and no outs with the Yankees down 3-0. Green entered with runners on the corners and no outs with the Yankees down 7-0. Trash managing. Boone seemed completely oblivious to his players’ strengths and the personnel available to him. And! And to make matters worse, because Lynn bowed out early, Green (29 pitches) and Jonathan Holder (38 pitches) soaked up multiple innings each and probably won’t be available for Game Four. This game was managed so poorly that the bullpen is going into Game Four shorthanded. A spectacularly terrible game for Boone. Among the worst managed games I’ve ever seen. I suppose the good news is the Yankees got their terrible pitching night and their terrible hitting night out of the way in Game Three. They had five singles and no walks in seven innings against Nathan Eovaldi, and the run didn’t score until the Yankees were down 10-0. Eovaldi threw 45 pitches in the first three innings and none of his 52 pitches in innings four through seven were stressful. Those five singles plus a garbage time walk were the only baserunners the Yankees had in Game Three. Giancarlo Stanton had two singles plus another rope that was right at an outfielder. As crappy as the Yankees have been against Eovaldi this year, Stanton was on everything in Game Three. Aaron Judge, Luke Voit, and Gleyber Torres had the other singles. Adeiny Hechavarria had the walk. Yuck. Congrats to Austin Romine. 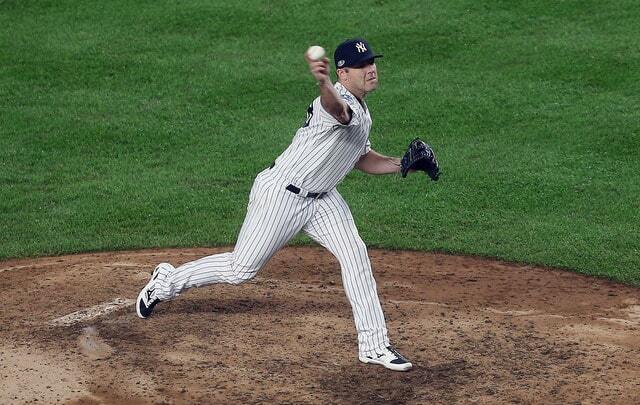 He is the second position player in baseball history to pitch in the postseason. Cliff Pennington is the other. Somehow I was at both games. Romine gave up a two-run home run to Brock Holt, which completed the cycle. First postseason cycle in baseball history. Pretty embarrassing! 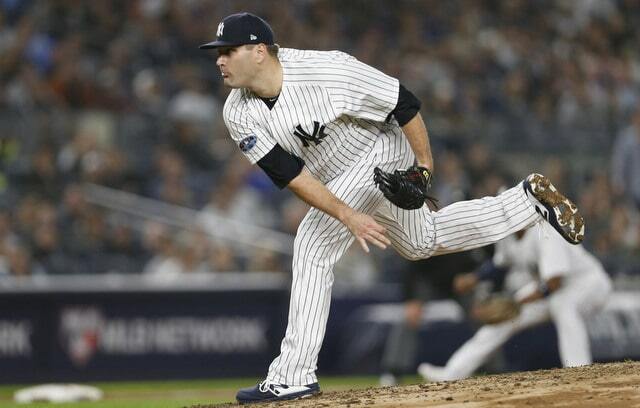 Romine is the first Yankees position player to pitch to Brendan Ryan threw two innings (!) against the Astros in August 2015. And finally, the only person to have a worse night than Boone was first base umpire Angel Hernandez. He had three calls overturned in the first four innings! Plus a fourth reviewed! An another play in the late innings that probably would’ve been reviewed had the score not been so lopsided. An elimination game. The Yankees are down 2-1 in the best-of-five ALDS and that means Tuesday night’s CC Sabathia vs. Rick Porcello game is a literal must win. That’s an 8:07pm ET.